Main contributions of the doctoral thesis are: adapting existing state-of-the art and developing new methods for handling large amounts of challenging biological data (with case studies in proteomics and metabolomics) and converting these methods into handy tools that can enable biologists and practitioners to carry out high quality data analysis without external help and with minimum effort. Potentially coupled with advanced machine learning models trained on rich health electronics data from Estonian health registries, these tools can be used to diagnose diseases before perceivable symptoms even appear. The supervisors of the doctoral thesis are Professor Jaak Vilo, Professor of Bioinformatics, Professor Pärt Peterson, Professor of Molecular Immunology and Hedi Peterson, Senior Research Fellow in Bioinformatics from the University of Tartu. ITL’s Ustus Agur Scholarship is awarded for supporting the studies of PhD candidates of the public university on the ICT curriculum. Allocation of the Scholarship considered the expected influence of the subject of the doctoral thesis of the scholarship applicant on the development of Estonian information society and his current professional activities. 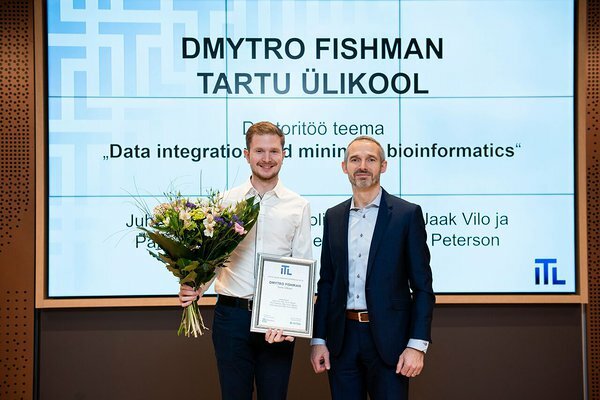 The scholarship amount is 2,000 euros and it is awarded in cooperation with the Estonian Association of Information Technology and Telecommunications and Estonian Information Technology Foundation for Education. ITL’s Ustus Agur scholarship is awarded from 2003.